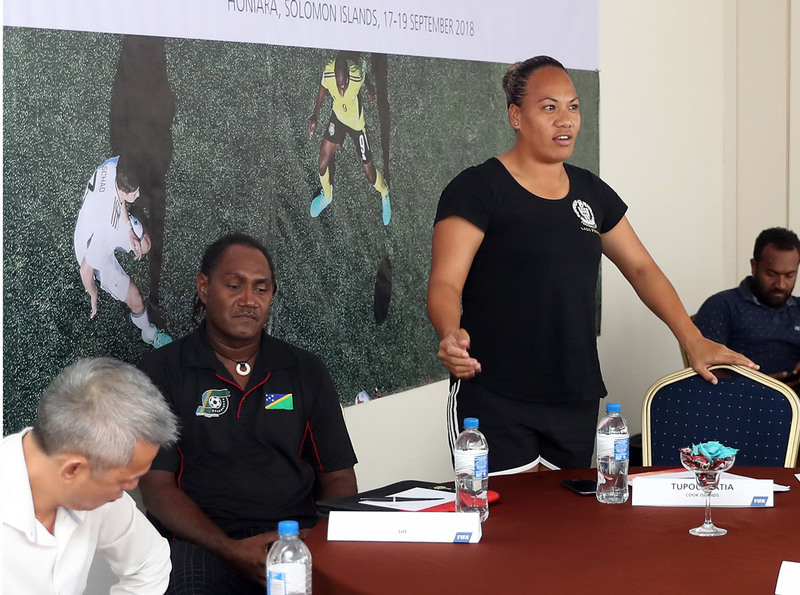 While all eyes are on Lawson Tama Stadium in Honiara, Solomon Islands and the possibility of some historic results from the OFC U-16 Championship, there is a small group of technical minds who are more focused on the results than most. Yesterday the FIFA Exchange Programme Pilot Project – Youth Football kicked off its first day with participants from Tonga, New Zealand, Cook Islands, Fiji, Samoa, Vanuatu and Solomon Islands representing their Member Associations. Being a pilot project, the outline of the three-day course is loose but organisers Jorge Diaz-Cidoncha Garcia and Philip Zimmermann – FIFA Youth Football and Grassroots Managers – are focused on having it answer to the needs of the participants and the region. “The FIFA President, when he started his mandate two-and-a-half years ago, presented a new vision called FIFA 2.0,” Zimmermann explained during the official opening. “If you read the document one of the things he is saying is that in the technical part he’d like to see an exchange and internship programme. He already organises these summits for General Secretaries and Presidents, but FIFA also wanted to organise something on this same level but focused on the technical side of football. Zimmermann said the exchange side of the project is getting key people from different nations, who will have the same interest of wanting to make football in the while region better, to share knowledge, experiences, best practices and also the difficulties they face in trying to achieve their football objectives. The exchange workshop, as with all technical workshops and seminars, will link theoretical sessions with practical sessions in order to get the most out discussions. Among the topics under discussion over the next three days is youth football development in specific nations and how FIFA has been able to assist with that development so far, player selection and talent identification, the importance of domestic youth competitions and the opportunity for future collaboration amongst Member Associations. OFC Technical Department representative Paul Toohey said the opportunity to engage in healthy exchange, with the OFC U-16 Championship in the background, is exciting for football development. “Whatever happens for the rest of the week with the tournament, for us to be here and part of that little piece of history, is fantastic,” Toohey said. “Youth development is a big focus for OFC over the next cycle leading up to the World Cup in 2026, so it’s good to come to a place where football is a big passion. The FIFA Exchange Programme Pilot Project – Youth Football is being held in Honiara, Solomon Islands from the 17-19 September 2018.